I started submitting my work for publication in the spring of 2012. 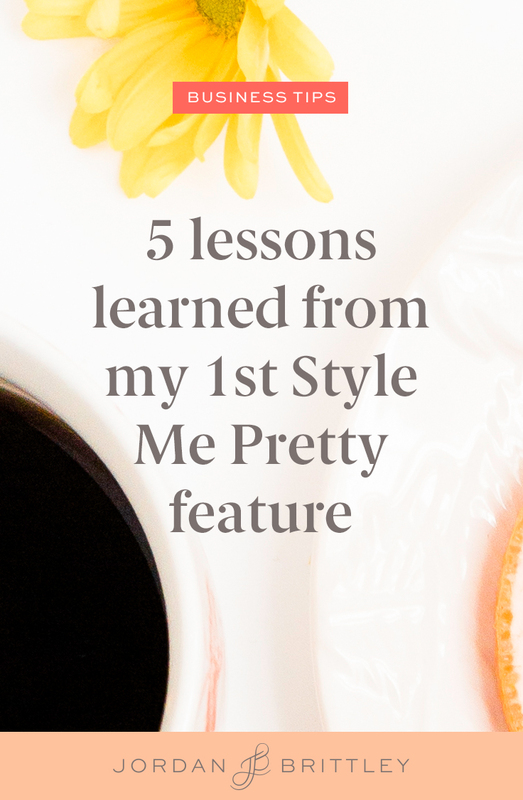 Style Me Pretty seemed like such a scary blog so it took me 5 whole months before I mustered up the courage to send them two weddings. Both were rejected and I was crushed. I poured my heart into those submissions and it was hard to know that it wasn’t the right fit for their blog. Because we all know those “right fit” words really mean that it didn’t fit at all. It took those two rejections from Style Me Pretty for me to become determined to be published on their blog. I did research… my own research. I spent 10 hours on their website the week leading up to Renee and Kevin's wedding. During that time, I realized that my first two submissions were nothing close to what they were wanting to show brides. It had nothing to do with the weddings. It had to do with the way that I arranged the submissions, the images that I chose and the way that the wedding was photographed by me. I styled the details in that Pittsburgh wedding like my life depended on it. I gave it everything I had. I meticulously edited that wedding so that each image would look beautiful next to any other random image in the gallery. I culled the wedding, only including the images that I knew the editor would want to see. I clicked “submit” and waited two whole weeks. I had convinced myself that there was no way they would publish the wedding so when I received their congratulations email, I didn’t believe it. But it happened. And I had my first Style Me Pretty feature. 5 lessons I learned from my first feature! Renee got ready in her friend’s adorable apartment and I fell in love with the wood floors and the dining room chairs. I didn’t know the first thing about styling details, so I kept things simple. I pulled in surrounding elements from around the house, photographing the rings on a book, the veil on the dining room chair, and more. This helps editors and their readers understand the environment and provide further inspiration! I photographed these kitchen details, these bagels, and this camera. Editors don’t want to see or share every great image that you took of the event. They want a curated gallery for their readers! SMP gives their readers options to view the entire gallery, so make sure you only include images that you would want to recreate in the future! I missed the instagram and twitter tag from Style Me Pretty because I wasn’t using those social media tools. I made sure that never happened again. The next time I was published, I tagged them first just to make it extra easy to find me! I was shocked by the number of inquiries that I received from brides after being published on Style Me Pretty! I was also in the middle of updating the images on my website and redoing my pricing, so if I had known that inquiries were going to pour in, I would have done all of this in advance. Getting published is a huge part of my marketing strategy! I hope the lessons I learned will encourage you to submit to your favorite blogs. And when you get published, come share the good news in our facebook group. See you inside!